Catalog Page 40. 4" Teeny Teddy Bears and 5" Clip-on Bears. Catalog Page 40. 4" Teeny Teddy Bears and 5" Clip-on Bears. The 4" small teddy bears have a pocket so they can be used as a finger puppet. The 5" clip-on bears have a metal spring-loaded clip inside so they can be attached to backpacks and clothing. These small bears are inexpensive and great for children. 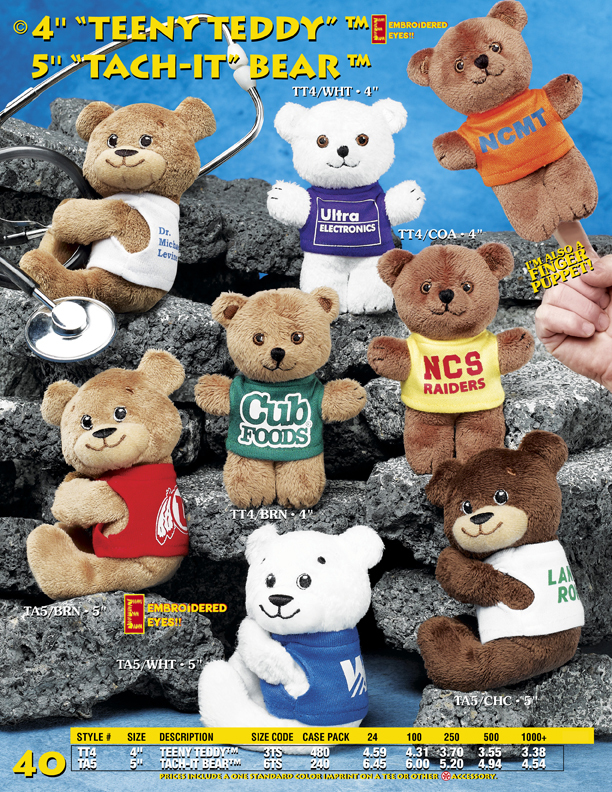 Useful for school fundraising events or tradeshow giveaways, these clip-on bears will be popular with your customers. We are shipping from New York. The set-up charge is $25.00 per order. The lead-time for production is 10 - 14 days.